New College Curriculum News | General Education, U.Va. First-year student Peyton Baylous arrived at the University of Virginia last August eager to start four years of science-heavy, pre-med study in the College and Graduate School of Arts & Sciences. Intrigued by a series of interdisciplinary seminars called the Engagements featured within the New College Curriculum that debuted last fall, Baylous explored topics far afield from the biology and chemistry lecture-and-lab classes she also took. In one of the Engagements seminars titled “Art Inside/Out,” she explored how art and artists from different eras shape human experience and culture. 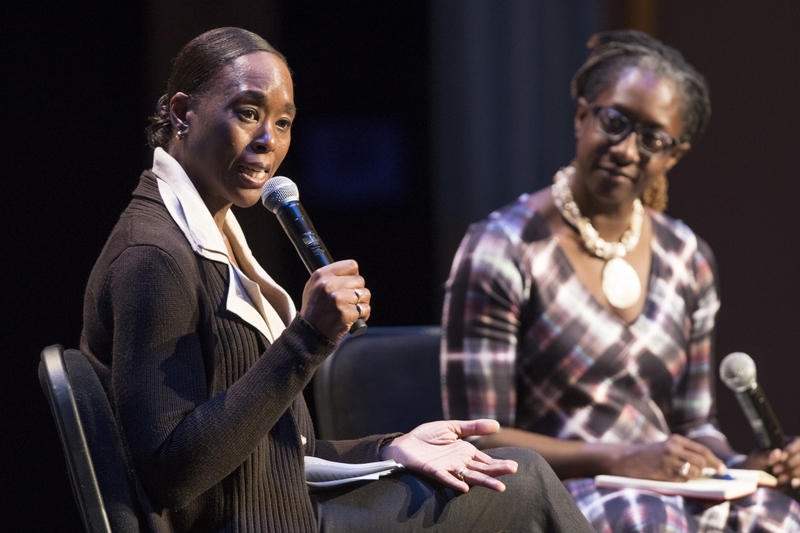 Baylous and the other first-year students who signed up for the New College Curriculum also served as the primary audience for the Engagements Lecture Series, which in its first year drew high-profile speakers such as Hidden Figures author (and UVA alumna) Margot Lee Shetterly and Harvard University political theorist Danielle Allen to Charlottesville. Baylous and other new curriculum students even got to pepper Arts & Sciences Dean Ian Baucom with questions about the future of liberal arts education at separate Engagements Lecture Series event in Old Cabell Hall. The wide-ranging topics of the Engagements courses in the new curriculum has Baylous considering the global possibilities open to her in the world of medicine. “The Engagements classes are always challenging your perspective, and I like that,” says Baylous, a native of Smithfield, Virginia. “I want to be a doctor, and I do think that the new curriculum has impacted the direction I want to take in my career. These courses make you think more not only about the science, but also ethics, social interactions and engaging with differing cultures that you may be interacting with. I want to go overseas now, work with Doctors Without Borders or a similar organization. About 600 first-year students elected last summer to enroll in the New College Curriculum pilot, one of three curricular options available to incoming students. This fall, the College is increasing the number of first-year spots available in the new curriculum to 800 first years. Designed to establish a compelling first year experience to better prepare students for their major, as well as their lives beyond UVA, the Engagements courses serve at the heart of the new curriculum. These two-credit courses encourage creative, ethical and critical thinking and help to create a shared academic experience for students as part of their time on Grounds. Four interdisciplinary areas are covered: “Engaging Aesthetics,” “Empirical and Scientific Engagement,” “Engaging Differences” and “Ethical Engagement.” Over the course of their fall and spring semester, first-year students in the new curriculum are required to take an Engagements seminar in each of the four areas. Biology professor Deborah Roach sees her Engagements seminar, “How Has Evolution Shaped Who We Are?” as an opportunity to go beyond the foundations of Charles Darwin’s work to help students understand how evolution has shaped us, and how the environment has influenced human evolution. Why is there variation in skin color? Why are most people vulnerable to altitude sickness, while other groups of people manage to live at the extreme elevations of the Andes and the Himalayas? How is malaria connected with the observation that, for more than 30 years, all the finalists in the men’s Olympic 100-meters had a recent ancestry in Sub-Saharan West Africa? Rising second year Levi Schult plans to pursue a degree in astronomy-physics, one of the most rigorous undergraduate majors, in terms of course requirements, offered within the College. The program, and the opportunity to conduct undergraduate research with Astronomy faculty such as College Fellow Kelsey Johnson, helped convince the Charlottesville native to stay close to home and attend UVA. At the same time, Schult says, the Engagements seminars have inspired him to consider taking classes in philosophy and religious studies, in addition to his astronomy requirements. Schult says the Engagements (he also took Roach’s seminar, Johnson’s seminar, “Beauty and Math in the Cosmos,” and a fourth Engagement titled “Debating Islams”) will make him a better scientist. E.J. Davis wasn’t sure what to expect when he sat down for the first day of his “Race, Racism, Colony and Nation” Engagements seminar last August. Less than two weeks after the violence in Charlottesville last summer, the memories of August 11 and 12 were still raw for students and faculty. A week before classes began, English professor Lisa Woolfork re-worked her syllabus for the class to include readings and class discussions on what the UVA community had just experienced. The Engagements model was designed to accommodate flexibility to enhance the learning experience, and the horrific events that happened in Charlottesville immediately put that theory into practice. The class discussions were charged, but enlightening, says Davis, a rising second-year from King George, Virginia. “We were all first years, just arriving at the University, and we were like, ‘OK, this just happened. Does this define our University? Does this define who we are?’ And part of what Professor Woolfork told us was that we all are going to have our own biases when we approach this topic, but we need to try and leave those biases at the door. “We all come from different parts of the country, and allowing those different perspectives and different backgrounds to interact in one room on one topic, it broadens your experience,” says Davis, who spent the summer interning in Washington, D.C. with the Federal Bureau of Investigation. “From the very first semester, I’ve found students doing incredibly engaging interesting work,” Woolfork says. “What we are trying to do is to get past this idea that school is a singular thing to be done,” Woolfork says. “That it’s not just a destination. That the journey is important. That the journey makes up how you approach the University, and your life. Another Engagement seminar, “Doing Fieldwork,” taught by postdoctoral anthropology fellow Roberto Armengol, offered Davis hands-on experience working with primary documents in the Special Collections Library. He researched the writings of early UVA faculty members who, while expressing personal doubts about the institution of slavery waited until their last wills and testaments to set their slaves free. “As an anthropologist, I’m not trying to convert [students] to anthropology, but I am, in this class in particular, showing them how the methods of field work are applicable across almost every discipline, including the sciences,” Armengol says. Davis says he remains focused on pursuing a legal career after graduating from UVA “[The new curriculum] forces us to develop our own opinions on pertinent matters to society, and to allow us to develop the skills to argue a point on our opinion, which is something that is going to be important to me as I develop my career as a lawyer,” he says. When Olivia Gwilliam signed up to take the “Extinction in Art and Literature” Engagements seminar taught by postdoctoral fellow Adrienne Ghaly, she did not anticipate that it would inspire her to found, along with more than a dozen classmates, a volunteer student group to promote greater awareness on Grounds of the UVA community's participation in behaviors that contribute to species extinction. The UVA Extinction Group's first project looks at the environmental cost of straws, Solo cups and other single-use plastics. Ghaly says she hopes her classes and the other Engagements are exposing first years who choose the New College Curriculum to not only different academic disciplines, but also different ways of thinking as well as to gifted teachers and researchers in departments they may not otherwise have explored. “This is the time of their academic careers that I would like them to have a renewed sense of curiosity and possibility and to be surprised by what moves them,” Ghaly says of her students. For Baylous, the rising second-year who wants to go to medical school, the Engagements have begun to open those doors to the possibilities of the next three years of undergraduate study.